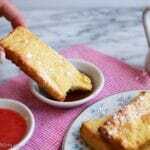 Air Fryer French Toast Sticks are quick and easy. They taste exactly like French toast cooked in a pan full of butter but better – no butter needed. Beat eggs with half-n-half, cinnamon and vanilla until fully mixed. Pour into a shallow dish or plate. Make an assembly line starting with the breadsticks, the egg mix and then a parchment paper lined cookie sheet. Dip each of the breadsticks into the egg, making sure to get all sides. Move to the cookie sheet. Cook 4 breadsticks at a time in the air fryer at 350° for 6 minutes, flipping them over after 3 minutes. Repeat until they are all cooked. You can keep them warm in a 200° oven or toaster oven.